The newly developed Kookaburra Game from EDUALC Z PROMOTIONS is a game is 5 different typical Australian animals, and the players compete to have their group of animals to be the first in a race through the Australian bush. Thus, each player receives a "squad" of 5 different animals: a Koala, a "Schnabeltier", a Kangaroo, a Crocodile and a Kookaburra. 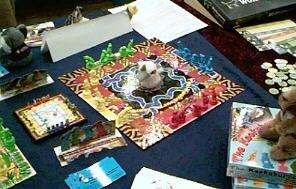 However, to move the figures on the gameboard, the players have to observe the unique rules for moving each of the figures. Thus, a Koala only can stop an Eucalyptus-leave, a Crocodile can eat other animals or a Kangaroo can carry other animals around in its bag. One of the most outstanding features of the game is the design: the gameboard is two sided, and while the first side shows a more or less standard gameboard with paths and rivers, on the other side a more abstract gameboard is shown which was made from original aboriginal artwork. This board and also the quite nice playing figures give the game a very fitting and suitable appearance, and the rules themselves offer for a nice and entertaining racing game. In total, the Kookaburra Game is a very good example of how a so far unknown publisher can produce a good and entertaining game. The official Homepage for the KOOKABURRA GAME.